Dockless bike share has been expanding in China and in many cities in the United States. “DoBi” first appeared in Los Angeles in late 2017. Today, three dockless companies are operating in different parts of L.A. City. There are also two docked bike-share systems. While some have criticized dockless systems for cluttering sidewalks, they can also be a relatively low cost transportation option for many Angelenos. The city of Los Angeles is currently working to establish parameters for dockless bike-share operations within city borders, with proposed rules and regulations expected to be heard at the city council’s Transportation Committee this month. Readers may have thought that five flavors of bike-share might be enough in L.A., but there is yet another company poised to enter the market. Last week, Streetsblog L.A. caught up with a representative from Zagster – which already operates some smaller scale private bike-share systems in Southern California. Zagster recently introduced their Pace dockless bike-share, which is already active in a few U.S. cities. SBLA talked with Tim Alborg, the Director of Public Policy and Government Relations for Zagster. SBLA: I know there are buildings in L.A. that have Zagster bikes, but let SBLA readers know a bit about the company and what it has done. Tim Alborg: We’re a U.S.-based company, headquartered out of Cambridge, Massachusetts. We have about a hundred employees. The company started back in 2007. It’s been around for more than ten years. We have over 200 bike-shares across the country, in over 35 states. We have a really great national presence. About half that 200 are in cities and universities. Here in the L.A. metro area, we have nearly forty Zagster bike-shares. Those are at commercial buildings and residential apartment buildings and what have you. We have over 400 bikes actually on the ground in the L.A. metro area, including Orange County. We also have a great team of mechanics that works to keep our bikes working in good condition. Describe the model on those bikes. Do they have a dock? A lock? 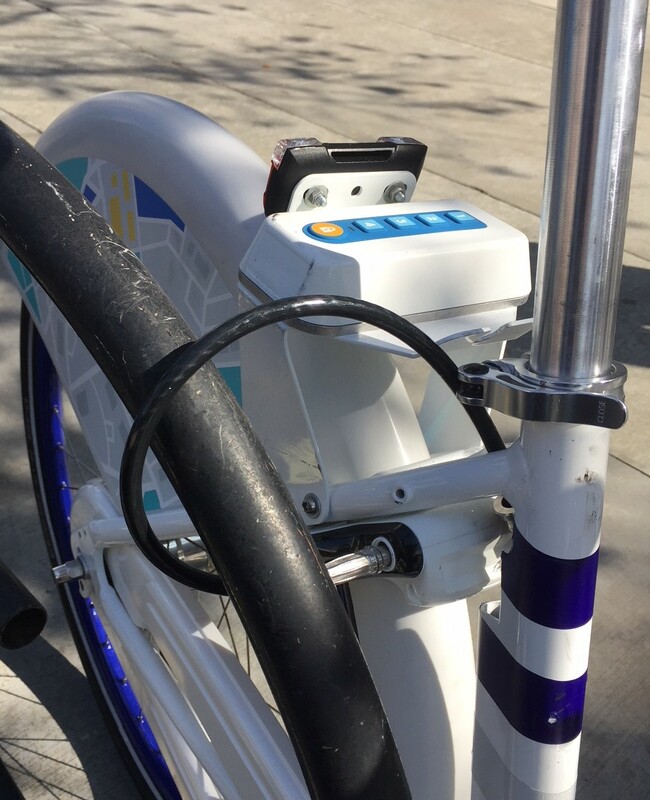 The Zagster bikes in L.A. are the first iteration of smart-bike tech we pioneered, with locks on bikes resulting in less expensive hardware and more flexible service. These bikes can be locked mid-trip. If a resident at an apartment building grabs a Zagster bike to go to the store – to go shopping for a couple groceries – throw ‘em in the basket and come back – they can actually hold the bike at that grocery store. Tell our readers a bit about how Zagster has entered the dockless bike-share business. Zagster has an exciting new brand called Pace. We like to think of it as “smarter dockless” – dockless without the drawbacks. We announced this new Pace brand at the end of last year. We’re in a couple cities already: Tallahassee and Knoxville, and we’ll be launching in a number of other cities in the next few months. Pace dockless bike-share bikes have two locks. The cable lock can be attached to bike racks. Photo: Joe Linton/Streetsblog L.A. The key differentiator is that our Pace bikes have two locks. These bikes have a traditional dockless rear lock to immobilize the rear wheel, but they also have a secondary lock so that the bikes can be locked to any public bike rack. In Dallas, Washington D.C., and some other cities, there have been some challenges with dockless bikes that are accidentally tipped over, or maybe picked up and moved. Some of them have even found their way into waterways and lakes. We’re really excited about Pace because it offers cities and residents a way to have dockless bike-share as a transportation option – in a way where you’re not creating urban clutter and blight. You’re ensuring that the public right of ways are clear for pedestrians and people with disabilities. At the end of the day, bikes shouldn’t be competing with pedestrians. Shared bikes should be competing with single-occupancy vehicles. We’re really excited about Pace bikes’ ability to lock to things. We think this is the way the industry is going. How do you expect Pace or Zagster bikes might be used by Angelenos? Who would use them? There’s a lot of people stuck in L.A. traffic that want to get out – want to break free of the L.A. traffic and want to have a reliable bike-sharing solution. Maybe if you’re driving all the way across town, bike-sharing is not going to be the right fit. But if you’re going to your neighborhood store, or if you’re going a couple of miles to see a friend, or you’re trying to a transit stop, then bike-sharing can be an option. We think that the Pace model of dockless bike-sharing is going to be the one that’s sustainable here in L.A. The existing dock-based program is limited, and Pace can fill the gaps. We’re really excited for people to one day be able to check it out themselves. Does Pace or Zagster have anything coming up – that you’re at liberty to talk about – in the state of California? Nothing I’m at liberty to talk about, but I will say that we’re operating our Zagster bike-shares in places throughout the state. And we’re definitely in conversations with a lot of city governments about Pace and how this can be another great transportation option. Some folks are critical of bikes-share for not serving low-income and disabled folks. Talk about what Zagster and Pace do to address this. One thing we’re also really excited about – and we think bike-sharing companies could be working on this more as an industry – is providing more options to those who traditionally haven’t been served – those who’ve traditionally been disadvantaged – when it comes to bike-sharing solutions. We’re really proud to lead the industry when it comes to accessible bike solutions – bikes for the disability community. We have a number of bikes that we’re able to offer to those with disabilities. We’re having that conversation with cities – letting them know that there are solutions for bike-sharing for people with disabilities, also for people who are in low-income neighborhoods or neighborhoods that haven’t traditionally been able to access docked bike-share. For dockless bikes with no stations, there’s no guarantee of coverage in those underserved areas. Bikes will more likely end up clustered in affluent, already well-served neighborhoods. *Zagster’s additional lock is a cable, which is easy to break. Still, it would deter vandals without a cable cutter. Meanwhile, JUMP/Social Bicycle has a u-lock solution which is more secure, and has proven effective in DC. *Zagster has deployed ~300 bikes in Tallahassee after winning an RFP, while Limebike had offered to deploy 1,800. Zagster also proposed charging $1,800 per bike per year, while Limebike charged nothing and offered revenue from sponsorships (and has paid cities elsewhere, as in Seattle, to set up bikeshare). *Zagster failed at Duke and has since been replaced by Limebike and Spin (though it might have fared better had it been dockless). It’s not clear if Tallahassee is now paying Zagster (maybe they changed things up with Pace). I believe Joe had a positive experience with Limebikes in LA, less so with Spin and ofo – Zagster does have quality bikes, though how they compare to Limebike (and whether the difference is worth the much higher price) is hard to say – neither one is electric in any case. All this isn’t to say Zagster is bad per se. But Streetsblog with other writers (not Joe) has insinuated there are Good Bikeshares and Bad Bikeshares, with VC funding as some Faustian bargain, and the absence of municipal subsidies as ominous. In reality, the bikeshares are converging somewhat, in their sources of funding and offerings, though legacy bikeshares sometimes charge more and offer fewer bikes. Also, it seems like Zagster only operates in cities where it can be exclusive. Which is fine for smaller cities, but they seem to charge (more) and put out fewer bikes (which is pretty much inescapable when you build & site dock$ and spend more per bike). How is this any different or better than Santa Monica’s Breeze Bike Share? Wheel-lock dockless bike shares are a problem as they can be locked and dumped anywhere. If dockless bike share is going to succeed, it needs to force people to lock to poles or racks, which are generally out of the pedestrian path of travel and reduce the chance of a bike being dumped in a river, someone’s front yard, etc. It looks like it has the sturmey archer dynohub. The taillight is dynohub powered I assume. Did you notice how they run the wire to the back? Good point. The companies are still iterating through new models so it seems like quality varies by city and even within each city and brand. And the story could change by year end. Parenthetically, I don’t understand why companies would even bother putting out substandard bikes when they all charge the same to ride for half an hour. If you get lower ridership due to low quality, you’ll have less to spend on maintenance. It is more similar to smart-bike Breeze than to smart-dock Metro Bike Share. I am not going to weigh in on “better.” The Breeze bike-share system is publicly-subsidized, and bikes are tied to docking stations (users are charged more if they leave the bike locked somewhere other than a dock.) Dockless bike-share is not publicly-subsidized (no up-front costs to government) and don’t have any docks at all. That’s why I think services like Jump (in DC and SF) have a much better chance to succeed. Good points! Many things to consider in an every changing bike share world. It’s amazing how smart bike share has advanced in the few years since Metro Bike Share was initiated, and SoBi failed to provide a working product for Metro staff to evaluate. But having bikes in a radius of a hundred feet of a fixed point, like Breeze, is much more user friendly than them being in some random sidewalk or parking lot like pure dockless bikeshare. Hey Joe, where did you get a chance to test ride the Pace bikes? Are they active anywhere so I can take one for a ride? I rode one in DTLA. They’re not active in CA as far as their rep stated, just in Tallahassee and Knoxville – but you can probably email the company and they can arrange something for you. If you can’t find an email handy online, then email me at joe at streetsblog dot org and I can give you one. There was a test one in downtown L.A. – not currently active there. You could go to Tallahassee or Knoxville – or probably just email the company. If you don’t find a contact online, email me at joe at streetsblog dot org and I can give you one. I met with them a week or two ago but they did not have a bike with them… was just curious when I saw the photo. Thanks! Totally. I just checked out their website and they def make you lock to something, in addition to the wheel-lock. Is Pedal Dockless Bike-Share Going Extinct?